At first the Kingdoms were undivided, and inhabited only by the various races of the fey (elves, dwarves, gnomes, trolls, ogres, etc) until the day a gate opened in thin air and the Ancients arrived, with the humans in tow. They fled a catastrophe in their own world and sought refuge in this new one. It took centuries to negotiate the treaties between fey and humans that allowed the newcomers to settle, but for a long time the Seven Kingdoms were at peace. However, the balance was upset by the arrival of the Strangers, cousins to the Ancients, the last to come through the Lost Gate from the dying world. They were unhappy with the conditions the Ancients had agreed to, and went to war with them, the humans and the fey for control of the land, and the magic academies. It was long and bloody, and ended with the Strangers annihilated and the Ancients severely weakened. The kingdom of Kaderria, which had been the Strangers’ seat of power throughout the war, was ruined. Fearing that sympathizers to the Strangers were still on the loose, the fey retreated from Kaderria, refusing to heal the land magically. And the Ancients stripped the human Kaderrians of the ability to use the Rule, to prevent the same, causing the kingdom to become isolated from its neighbours in the time since. Most of the humans now live in the southeast, in the countries of Kep, Findain and Azar. Greymoors are sparsely populated and its fey and human inhabitants are distrustful of one another. In the northwest, in Broewende, the fey majority and human minority live together without any tension. 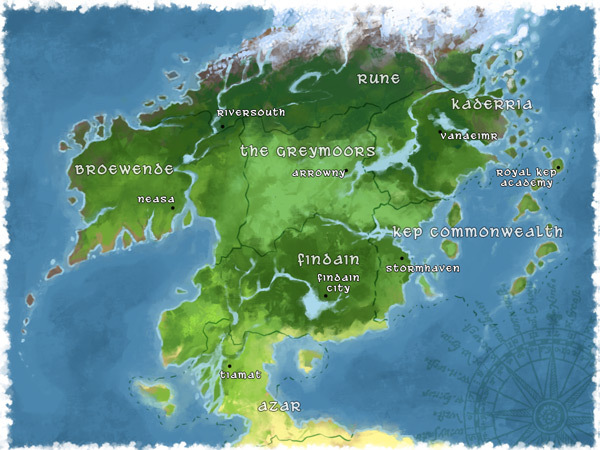 The kingdom of Rune is almost uninhabited, by both fey and humans, due to its cold climate and the dangerous remnants of the wars. At first, there was only the Song, the formless, ancient, wild magic that makes up the fabric of the world. When the Ancients arrived, they created a system to allow humans to learn how to manipulate the unpredictable Song. Known as the Rule, it is a complex language that requires years of study and decades of practice to truly master. The theoretical aspects of the Rule are often taught in wealthy or noble families, but few have the dedication and patience required to complete their studies. Those who do spend at least ten years in one of the Rule Academies before graduating as official thaumaturges. Those who don’t complete their practical studies are disreputable sorcerers or witches, their unpredictable powers making dealings with them a dangerous thing.